W.W. Jacob’s short story “The Monkey’s Paw” was first published in 1902 and is rather a scary tale. To this day it is often included in anthologies and the story has stood the test of time quite well. This recording of the story is narrated by B.J. 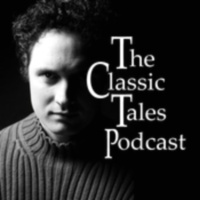 Harrison and was originally released as episode six of The Classic Tales Podcast. It has a runtime of about twenty-seven minutes. “The Monkey’s Paw” is, among other things, a cautionary tale and it always makes me think of the old saying Be careful what you wish for. At the beginning of the story Mr. White and his son Herbert are enjoying a quiet game of chess while Mrs White sits knitting by the fireplace. It may be warm and cosy in the White’s parlour, but it is cold and wet outside and, despite Mr White’s best efforts to distract his son by commenting on the weather, Herbert is winning. The Whites do not take this seriously and Herbert, who is especially amused, asks Morris why he does’t try having three wishes on it. The Sergeant-Major turns pale at the memory and replies that he already has, and all three of them were granted. He refuses, however, to speak of what he wished for or what happened, though he does admit to being the second man to own the paw. The first owner also had his wishes granted. Morris has no idea what the first two wishes were, but the man’s third wish was for death. In an attempt to end to the monkey paw’s evil magic Morris throws it into the fire. White is unable to watch such an opportunity go up in smoke though and snatches it out of the flames. “Better let it burn,” Morris warns; but some lessons are learned only when it is too late. White keeps the paw, wishes on it and pays the price. One of the things that I like about this story is that the worst things in it are left to the reader’s (listener’s) imagination. Sometimes that storytelling technique works far better than a vivid description does and I think that is the case here. Harrison does a good job of narrating the story and I like voices he gives to the characters. My favourite is the growl-like voice he adopts whenever the sergeant-Major speaks. This is a good recording of a real classic tale and if you are not familiar with the story you are missing out.